The end of another month & I’m just about keeping up with my SVR photo diary. Only 6 photos today, but it was dull & cold – maybe I’m saving myself for next weekend and the Gala! This entry was posted in Sharpo's World Photo Updates on February 28, 2010 by Sharpo. For several weeks we’d been saying there were no baby lambs around, not surprising really with this cold winter, but on Saturday whilst on the train between Highley & Arley we saw some in the fields. Other parts of the country may have had them for days or weeks, but at least it makes us feel the warmer weather can’t be far away, hopefully. This entry was posted in Uncategorized on February 28, 2010 by Sharpo. 5786 arrived several days ago, also 7802 has returned, the 2 locos being seen at Bewdley. DMU & 4566 seen working trains, but I was not expecting 7812 on an “extra”, although did manage a shot of the headboard. A few more shots inside The Engine House before the TPO is removed, to be replaced by a Royal Saloon sometime soon. 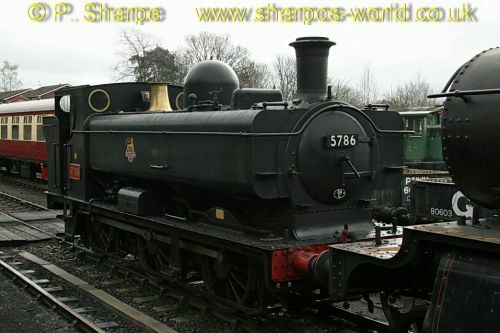 My first photo of 5786 for many years…. This entry was posted in Sharpo's World Photo Updates on February 27, 2010 by Sharpo. A light engine plus support coach working from Bury to Tyseley. Later in the day, 70013 ran to Southall. The original plan was to take photos from the road bridge outside the station, but due to road works it was impossible to look from the bridge. The wind was blowing the wrong way, unfortunately. This entry was posted in Sharpo's World Photo Updates on February 24, 2010 by Sharpo. 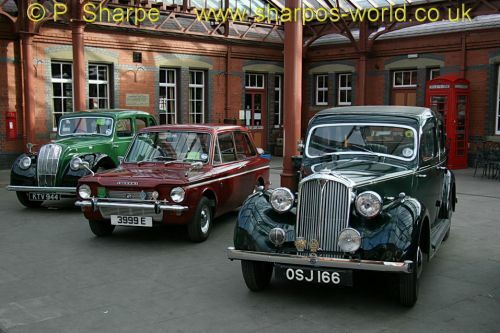 96 photos of vehicles, taken at Kidderminster, Bewdley, Arley & Highley. A bitterly cold day, can’t be much fun driving in the older vehicles without heaters! I’ll get round to adding registrations sometime soon. This entry was posted in Sharpo's World Photo Updates on February 23, 2010 by Sharpo. A covering of snow during the night, but it melted quickly in most places so not much seen in the photos. There was sunshine, but it still felt very cold & we were glad to get back on the train at Arley. This entry was posted in Sharpo's World Photo Updates on February 22, 2010 by Sharpo. Half term week & a 2 train service. We saw both the trains when we called in at Bewdley for lunch. Mrs. S. wanted to give the DMU a miss today (she prefers “real” trains) so we travelled behind 7812 on the diner to Arley to get our sandwiches & drinks. We were glad when the diner returned, as it was a chilly day – even though the sun was shining. 46443 was the other loco in service. 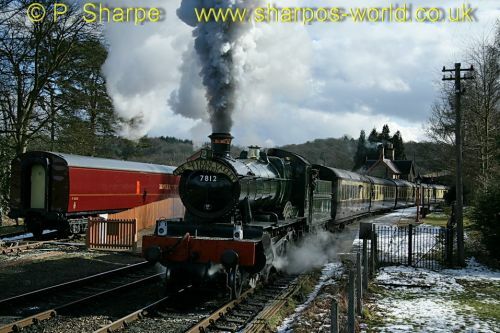 This entry was posted in Severn Valley Railway on February 21, 2010 by Sharpo. After watching the double-header from Tyseley on the main line, off to Kidderminster to see some of the classic cars on show. Then catching the first train behind 4566 to Arley, then DMU to Highley, 7812 back to Bewdley & finally 4566 back to Kidderminster. Plenty of cars to see, but I think the frosty weather did reduce the numbers. A journey from Bewdley to Highley & return behind 7812. 46443 was hauling the other train. Didn’t forget my Highley Slice – yummy! 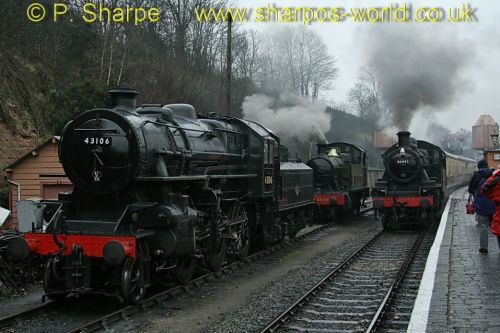 This entry was posted in Severn Valley Railway on February 19, 2010 by Sharpo. I’ll sort a photo or two later. This entry was posted in Main line on February 15, 2010 by Sharpo. The Class 20 was an unexpected bonus today. I was planning to continue to Highley after lunch at Arley, but the sound of an approaching diesel meant a change to my plans. 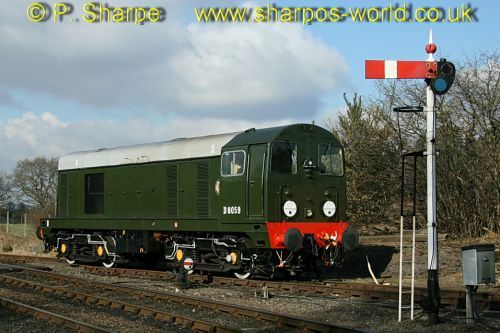 D8059 had run up from Bewdley after the DMU and was to shunt the sidings at Arley, as you will see in the photos. After repositioning the stock it returned to Bewdley after my train, which was hauled by 7812. And sometimes the sun does shine….. This entry was posted in Sharpo's World Photo Updates on February 15, 2010 by Sharpo.